ICC is set to run a one-off training and official launch of the ICC Uniform Rules for Bank Payment Obligation (URBPO) at its Paris headquarters on 17 May 2013. Using case studies, the event will feature a full public presentation of the new rules, followed by an exclusive training session under the expertise of members of the Rules’ Drafting Group. It will equip participants with everything they need to know to get started using URBPO and its related ISO 20022 standards. 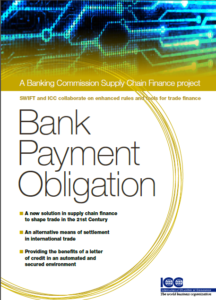 Developed by the ICC Banking Commission in partnership with the financial messaging provider SWIFT and set to come into force on 1 July 2013, the URBPO are an alternative means of settlement in international trade, and an innovative solution in supply chain finance for trade in the 21st century. Open to Chief Financial Officers, corporate credit and risk managers, corporate treasurers, bankers, insurers, consultants and vendors active in trade and supply chain finance, the training and launch will provide valuable insight from the ICC URBPO Drafting Group and give a detailed presentation of each rule while also exploring the corporate perspective of URBPOs. For a detailed brochure or to register, please click here. For more information on the rules visit URBPO.